Out of 65 startup founders, 77% of them took a major in a non-tech related degree while only 23% founders took up tech as a major. The most popular non-tech major was Finance (9 founders), Business (9 founders) and Law (4 founders). As Google and Temasek last year revealed that the future e-commerce sector will become a US$200 billion economy by 2025 in Southeast Asia, many have either joined an e-commerce workforce or initiated a startup in this fast growing industry. With Amazon's recent entry into the region and great successes of local e-commerce startups, the message has been crystal clear to youngsters that we're at the cusp of the e-commerce boom. However, what major should a pre-tertiary student embark on if one aspires to be an e-commerce founder? Must one study a tech-related field? Did most founders obtain tech know-how prior to founding their e-commerce? What education did startup founders in Malaysia embark before they became successful? As such, we made a study to answer these questions. 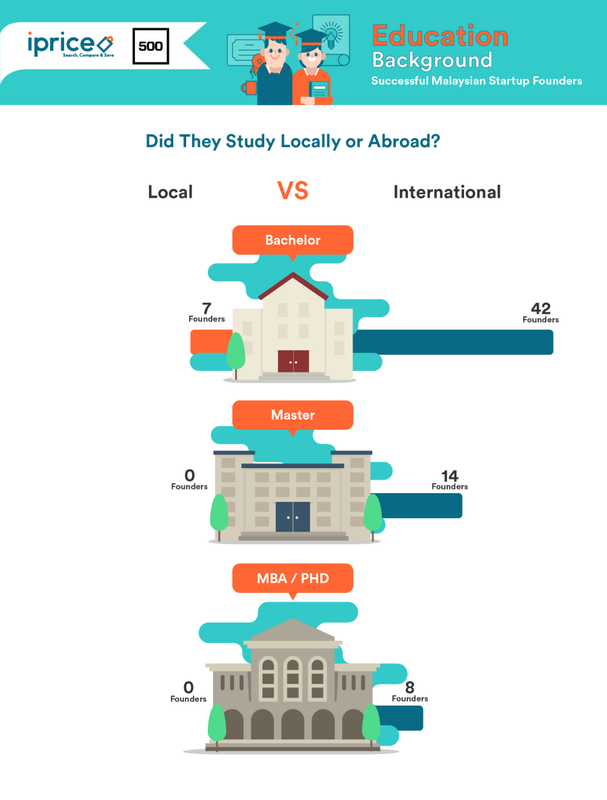 By analysing LinkedIn profiles, company websites and reliable news sources, we analysed the education background of successful startup founders in Malaysia. This sampling is only limited to founders who have successfully obtained a Series A or a higher funding round for their startup. Although e-commerce exists through modern technologies, understanding elements such as finance, law and the business behind it remains paramount. This was reflected as we discovered that most founders did not study a tech-related degree prior to founding their e-commerce startup. However, this might be reflective of the lack of tech professionals in Malaysia as well. A recent report by HAYS has highlighted that Malaysia is lacking tech talents which might hinder the growth of e-commerce in the nation. As e-commerce continues to expand in Malaysia and the region, there will be growing demands of talents with technical expertise. The most popular tech majors among founders were Computer Science (8 founders), followed by Information Systems (2 founders), Software Engineering (2 founders) and IT (2 founders). Interestingly we found that 35 out of 65 founders did not obtain a postgraduate degree before founding their e-commerce startup. This was probably a sign that most founders discovered a niche demand in the market and went on to initiate their startup. In a research by Forbes, it was highlighted that 42% of startups failed because they offered products or services with little or no market need at all. So yes, while the opportunities are great in Southeast Asia, aspiring e-commerce founders must first determine a niche market need before initiating their e-commerce business. 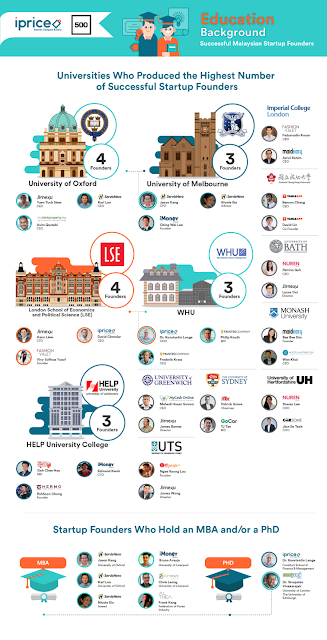 Among all the universities listed in the infographic, HELP University College was the only local institution which produced a number of successful founders. Three founders who graduated from HELP are PohSoon Chong who co-founded Hermo (recently invested by istyle Japan), Edmund Kwok and Goh Chee Hau who founded iMoney. Meanwhile, the most popular non-local universities which produced three or more founders were the University of Oxford, London School of Economics and Political Science (LSE), University of Melbourne and WHU, Otto Beisheim School of Management. We also noticed that eight founders went on to complete the prestigious Masters of Business Administration (MBA) or a Doctor of Philosophy (PhD). Six of them who obtained an MBA are Bruno Araujo (iMoney), Chris Leong (Soft Space), Frank Kang (Althea), Jason Kang (ServisHero), Karl Loo (ServisHero) and Nicole Sia (ServisHero) and Dr Konstantin Lange (iPrice Group) who obtained a PhD. Amongst all the founders, only one, Dr. Sivapalan Vivekarajah (EasyUni) who obtained both a MBA and a PhD. 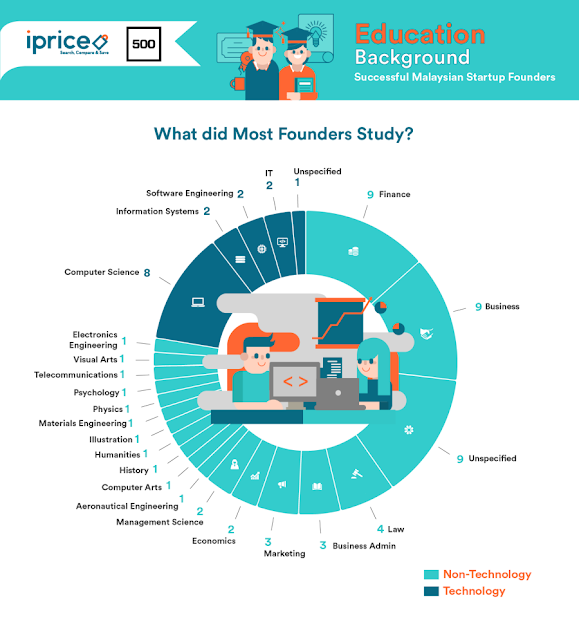 This is a study by iPrice Group and 500 Startups on the education background of successful founders in Malaysia.